Autograph album started in 1860 by Jerusha C. Hubbard of Middletown, Connecticut, with inscriptions from relatives, friends and people associated with Wesleyan University at Middletown. Jerusha later added notes next to the names of many inscribers to indicate that the inscriber had married or died. 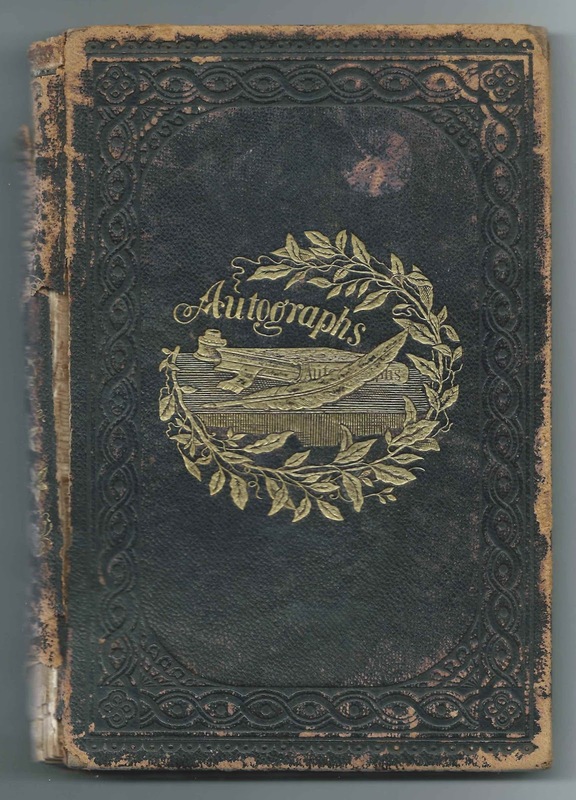 The album measures approximately 7-3/4" by 5-1/4" and contains the sentiments of over 120 people, many of whom signed pages with one or more others, some with a connection to each other, some apparently randomly. An alphabetical surname list and an alphabetical list of the inscribers, together with any personal information they offered and any note that Jerusha left, appear at the end of this post. Jerusha C. Hubbard was born September 27, 1844, the daughter of Elijah H. Hubbard and Mary Jane (Badger) Hubbard of Middletown, Connecticut. Jerusha died on September 23, 1900 and is buried with family members in the New Farm Hill Cemetery at Middletown, Connecticut. It appears that she never married. Jerusha had a brother, William Hendley Hubbard, born in 1842, who is presumably the William H. Hubbard who inscribed facing pages in his sister's album, in 1860 and in 1868. One page was inscribed by H. E. Balcam, a lieutenant in the 27th Regiment, presumably Connecticut. 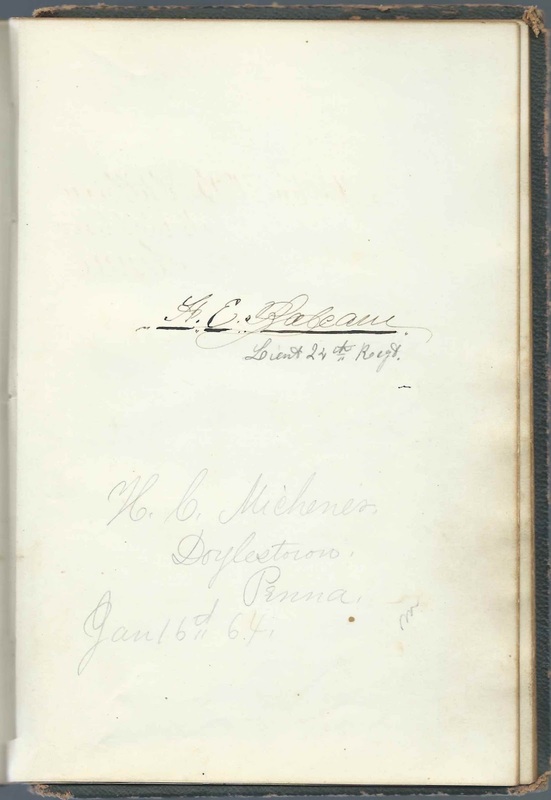 H. E. Michener of Doylestown, Pennsylvania, also inscribed the page. 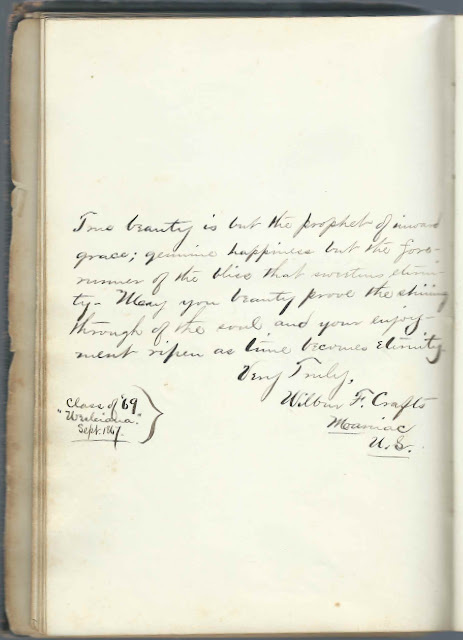 Another page was inscribed by W. Frank Vinal and William Sheridan Todd, a native of Coleraine, Massachusetts. They were members of the Class of 1864 at Wesleyan University. Lizzie Colson of Danville, Pennsylvania, also inscribed the page and may have been a Wesleyan student as well. Wilbur Fisk Crafts, who was born at Fryeburg, Maine, on January 12, 1850, inscribed a page in September 1867. Wilbur's brother, Frederick Henry Crafts, also inscribed a page. He graduated from Wesleyan University with the Class of 1871. 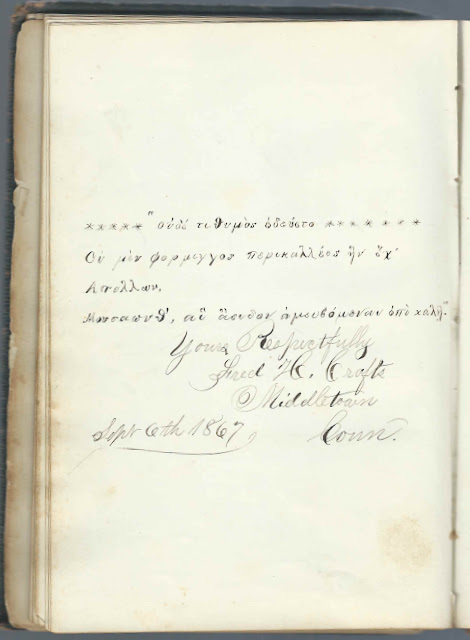 Two other Crafts siblings attended Wesleyan but didn't inscribe pages in Jerusha's album. Inscribers in the Album - given names within a surname are not necessarily in alphabetical order. Libbie of Middletown, Connecticut; "your friend and schoolmate". Whether random or not, I don't know, but she shared the page with Ella A. Bulkley. Elenora P? or R? of Middletown, Connecticut, inscribed on July 5, no year written. Whether random or not, I don't know, but she shared the page with Ellen S. Beebe. Diamonds, inscribed at Middletown, Connecticut, on March 3, 1865. Jerusha's later note: "Married". Inscribed another page on which Jerusha noted: "Died Dec 1882"
R. B. Atwood of Watertown, Connecticut, inscribed at Middletown, Connecticut, in July 1860. Jerusha's later note: "Died 1862"
Harriet R. Baldwin of Middletown, Connecticut, inscribed on April 27, 1860. Whether random or not, I don't know, but she shared the page with Sara E. Morgan and V. P. Moody. Lizzie Baldwin of Middletown, Connecticut, inscribed on November 10, 1860. Jerusha's later note: "Died Oct. 4, 1863". Whether random or not, she shared the page with Sophia M. Sill and Florence L. Cole. Ellen S. Beebe of Middletown, Connecticut, inscribed on January 1, 1861. 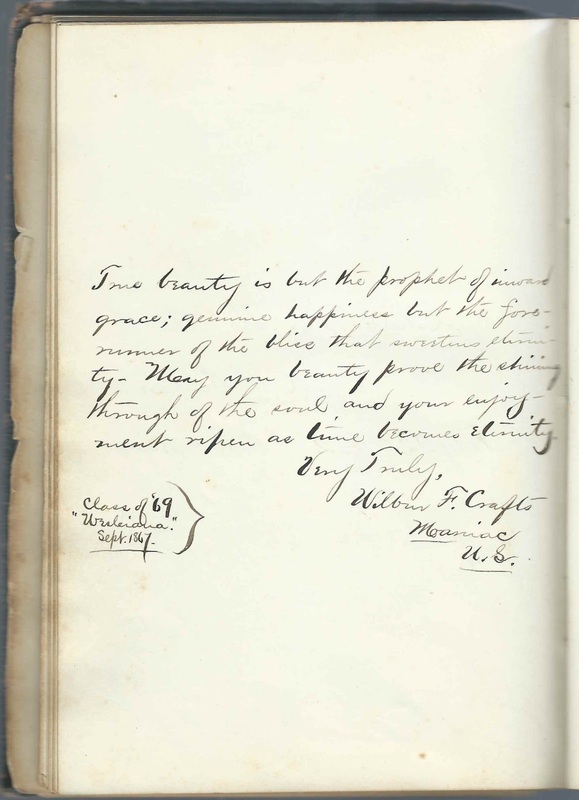 Whether random or not, I don't know, but she shared the page with Elenora P or R.
Flavel N. Bliss, inscribed at Middletown, Connecticut, on November 22, 1863. Jerusha's later note: "Married"
Cynthia P. Bolton of Portland, Connecticut. Whether random or not, I don't know, but Cynthia shared the page with Jennie M. Burr. Nellie M. Carter of Middletown, Connecticut, inscribed on October 10, 1860. Jerusha's later note: "Married May / 62"
Maggie C. Carter of Middletown, Connecticut, inscribed on October 9, 1861. Jerusha's later note: "Married. Died"
Annie Chamberlain. The letter "M" was presumably written by Jerusha later to signify Annie's marriage. Whether random or not, I don't know, but she shared the page with Mary Neale. Florence L. Cole of Springfield, Pennsylvania, inscribed on July 30, 1862. Whether random or not, she shared the page with Sophia M. Sill and Lizzie Baldwin. Alice H. Coles of Middletown, Connecticut. Jerusha's later note: "Married" Presumably Alice Hubbard Coles, who married Eugene Seabury Belden about 1866. Whether random or not, I don't know, but she shared the page with Ellen R. Doan. Lizzie Colson [not sure of name as it's written in code] of Danville, Pennsylvania, inscribed in March 1861. Whether random or not, I don't know, but Lizzie shared the page with W. Frank Vinal and William S. Todd. Fred H. Crafts of Middletown, Connecticut, inscribed on September 6, 1867. He wrote part of his inscription in Greek. Wilbur F. Crafts of Moaniac, U.S., "Class of '69 Wesleyan, Sept. 1867". Presumably Wesleyan University at Middletown, Connecticut. Jennie C. Doan of Pennsylvania, inscribed at Middletown, Connecticut, on October 18, 1860. Jerusha's later note: "Married / 72". S. O. Doan of Leonard Hollow, Pennsylvania, inscribed on August 1, 1862. Whether random or not, I don't know, but S. O. Doan shared the page with Eliza H. Hubbard and Ellen H. Hubbard. Sarah N. Emery of Portland, Connecticut, inscribed on April 26, 1860. Whether random or not, I don't know, but Sarah shared the page with Mary F. Ward and Frances A. Cole. Lizzie Finley of Middletown, Connecticut, inscribed on July 17, 1860. Jerusha's later note: "Married 1. 62"
Charles D. Gabrielle. Jerusha's later note: "died"
Mary J. Gabrielle of Middletown, Connecticut, inscribed on December 21, 1860. Jerusha's later note: "Died 1861". Whether random or not, I don't know, but she shared the page with Ella Hennigar. Lillie E. Gould of New Haven, Connecticut, inscribed at Middletown, Connecticut, on March 8, 1862. Jerusha's later note: "Married"
C. ? H., possibly C. T. H., of Middletown, Connecticut, inscribed on December 6, 1863. Perhaps the H stood for Hubbard. L. K. H. of Cobalt, Connecticut, inscribed on February 17, 1863. Jerusha's later note: "died". Could the surname be Hubbard? Alpie H. Hall of Portland, Connecticut. Whether random or not, I don't know, but Alpie shared the page with Ellen Hall and Fannie E. Ward. Ellen Hall of Portland, Connecticut, inscribed on April 26, 1860. Jerusha's later note: "Married". Whether random or not, I don't know, but Ellen shared the page with Alpie H. Hall and Fannie E. Ward. Nellie Haskell of Middletown, Connecticut, inscribed on October 9, 1861. Whether random or not, she shared the page with Susie F. Sellers. Leora Hedges of Feeding Hills, Massachusetts; Jerusha's cousin. Whether random or not, I don't know, but she shared the page with H. D. Smith. Maggie J. Hempstead of New London, Connecticut, inscribed at Middletown, Connecticut, on June 29, 1861. Jerusha's later note: "Married"
Ella Hennigar of Sag Harbor, New York. Whether random or not, I don't know, but she shared the page with Mary J. Gabrielle. A. F. H...d. Not sure of last initial, but if H, the surname might be Hubbard and possibly Jerusha's cousin Anna F. Hubbard, daughter of Fanny (Johnson) Hubbard and Sylvester B. Hubbard, a brother to Jerusha's father Elijah H. Hubbard. Jerusha's later note: "Married". If the inscriber was Anna F. Hubbard, the note refers to her marriage to James Pardon Fay on April 10, 1866 at Long Hill, Middletown, Connecticut. William H. Hubbard of Middletown, Connecticut, inscribed on September 19, 1860. 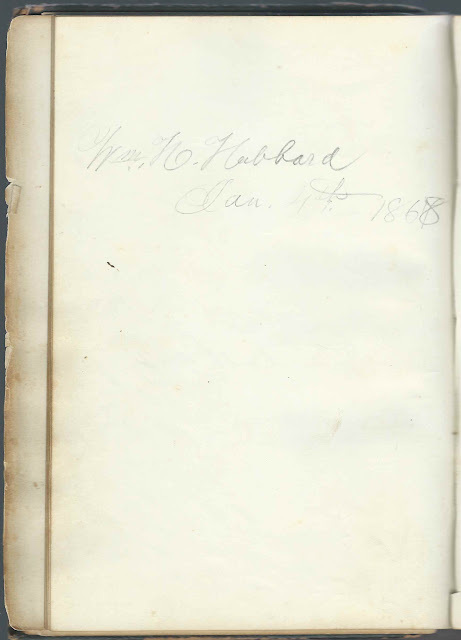 Presumably Jerusha's brother William Hendley Hubbard, who also inscribed the left facing page on January 4, 1868. Jerusha's later note: "Married / 66"
George R. Hubbard; possibly the same George R. Hubbard who inscribed another page. Also mentions "Diamonds", who is mentioned on another page. Ellen H. Hubbard of Middletown, Connecticut, inscribed on August 3, 1862. Whether random or not with respect to S. O. Doan, I don't know, but Ellen shared the page with S. O. Doan and Eliza H. Hubbard. 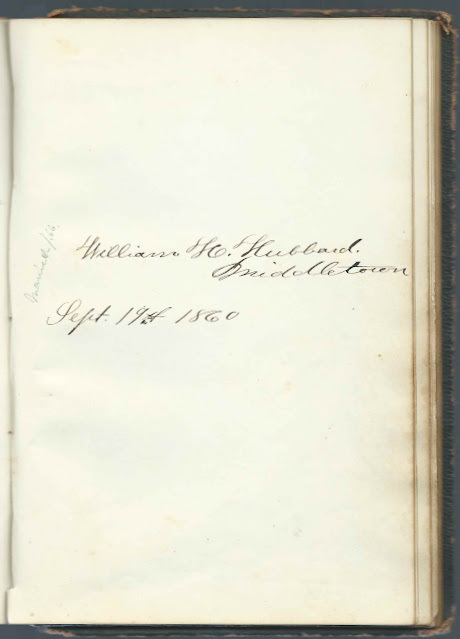 Willie E. Hubbard of Middletown, Connecticut, inscribed on January 12, 1880. Whether random or not with respect to Gertie J. Hayes, I don't know, but Willie shared the page with Gertie J. Hayes and Ella Hubbard. Ella Hubbard of Middletown, Connecticut, inscribed on January 12, 1880, Whether random or not with respect to Gertie J. Hayes, I don't know, but Ella shared the page with Willie E. Hubbard and Gertie J. Hayes. Sarah A. Johnson of Feeding Hills, Massachusetts. Shared the page with Mrs. Isaac Roberts. Amelia I. Johnson of Clinton, North Carolina, inscribed on August 31, 1867. Whether random or not, I don't know, but shes shared the page with M. Louise Sellers. George S. Lewis, Jr., of Springfield, Massachusetts, inscribed on September 9, 1860. Jerusha's later note: "Married". Whether random or not, I don't know, but he shared the page with Mattie C. Roberts. Mary L. Mansfield of Middletown, Connecticut, inscribed on March 18, 1862. Jerusha's later note: "Died the spring of 63"
Charles M. Mather of Middletown, Connecticut, inscribed on February 22, 1862. Jerusha's later note: "Married; died"
Kate E. Millar of Middletown, Connecticut, inscribed on February 23, 1861. Jerusha's later note: "Married July 4, 1864"
Nellie H. Rand of West Meriden, Connecticut. Jerusha's later note: "Married. Died". Whether random or not, I don't know, but Nellie shared her page with Mary H. Lucas and Fannie A. Hubbard. Mrs. Isaac Roberts of Feeding Hills, Massachusetts. She was presumably Cornelia (Clark) Roberts. Shared the page with Sarah A. Johnson. M. S. Roberts of Feeding Hills, Massachusetts, inscribed on November 25, 1863. Perhaps Morton Samuel Roberts. Shared the page with H. V. Roberts. Mattie C. Roberts of Feeding Hills, Massachusetts. Whether random or not, I don't know, but she shared the page with George S. Lewis. Elisha Sears, inscribed on April 30, 1860. Mary H. Sears, inscribed on February 16, 1864. Jerusha's later note: "Married Jan. 18 /65". Whether random or not, I don't know, but Mary shared her page with Carrie E. Smith. Susie F. Sellers of Pittsburgh, Pennsylvania, inscribed on June 23, 1865. The letter "M" was presumably written by Jerusha later to signify Susie's marriage. Whether random or not, she shared the page with Nellie Haskell. Emma Sellers of Meriden, Connecticut. Jerusha's later note: "Died". Whether random or not, I don't know, but Emma shared the page with Carrie T. E. Sill. Sophia M. Sill of Middletown, Connecticut, inscribed on April 7, 1862. Whether random or not, she shared the page with Lizzie Baldwin and Florence L. Cole. Carrie T. E. Sill of Middletown, Connecticut, inscribed on April 7, 1862. Whether random or not, I don't know, but Carrie shared the page with Emma Sellers. Addie E. Smith of Portland, Connecticut, inscribed on March 6, 1862. Whether random or not, I don't know, but she shared the page with Carrie Thayer. H. D. Smith of Middletown, Connecticut, inscribed on November 22, 1863. Whether random or not, I don't know, but H. D. Smith shared the page with Leora Hedges. M. Louise Sellers of Pittsburgh, Pennsylvania, inscribed at Middletown, Connecticut, on January 7, 1862. Whether random or not, I don't know, but she shared the page with Amelia I. Johnson. Fannie P. Stillman of Middletown, Connecticut, inscribed on April 9, 1861. Jerusha's later note: "died June 1873"
Carrie Thayer, inscribed at Higganum, Connecticut, on March 6, 1861. Whether random or not, I don't know, but she shared the page with Addie E. Smith. William S. Todd, Class of 64 at Wesleyan University, Middletown, Connecticut. Whether random or not, I don't know, but William shared the page with W. Frank Vinal and Lizzie Colson. 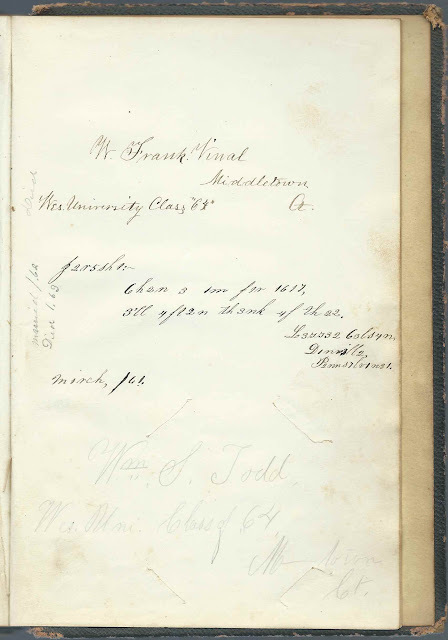 W. Frank Vinal of Middletown, Connecticut, inscribed at Wes. University, Class of '64. Wesleyan University. Jerusha's later note: "Died". Whether random or not, I don't know, but W. Frank Vinal shared the page with Lizzie Colson and William S. Todd. Emma L. Ward of Pittsburgh, Pennsylvania, inscribed on October 18, 1863. The letter "M", presumably meaning "Married", may have been written by Jerusha later. Mary F. Ward of Middletown, Connecticut, inscribed on May 11, 1862. Jerusha's later note: "Died 1863". Whether random or not, I don't know, but Mary shared the page with Sarah N. Emery and Frances A. Cole. Carrie T. Wetmore; she wrote what looks like the initials Y.L.S., perhaps signifying "Young Leaders Society". Jerusha's later note: "Married 1867; died"
Hattie J. Wilder of Groton, Massachusetts, inscribed on June 26, 1861. There's a faint date of 8th of December 1861, hopefully not a death date that Jerusha added later. Mary Woodworth of Middletown, Connecticut, inscribed on October 9, 1861. Whether random or not, I don't know, but she shared the page with Isabelle P. Morgan, or Isobell P. Morgan.